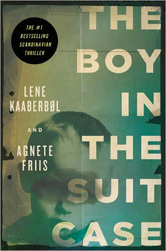 translated by one of the authors, Lene Kaaberbol. Soho Press, 2011. First published in Denmark in 2008. The Boy in the Suitcase tells a story from the point of view of the four main characters. Jan is a rich Danish businessman who is very fond of his wife, Anne, and her family. He goes on a business trip, or so he tells her, but becomes stuck on a plane due to a series of technical problems. He therefore phones Karin, who works for him, and asks her to undertake the work he’s set out to do. She agrees, reluctantly. Nina is a nurse who works for an organisation helping abused women and children, as well as illegal immigrants. She receives a desperate phone call from Karin who asks her to do Jan’s assignment in her place. Nina was Karin’s closest friend but the two have been estranged for years. Karin knows that Nina is part of a mysterious “network” and hints to her that this is why she is asking for Nina’s help. Nina agrees. The other two characters live in Lithuania. Jucas is married to an older woman, Barbara, and dreams of moving with her to her home town of Krakow. But first, he feels he has to make plenty of money. Jan is his ticket. Finally Sigita, a young mother, is plunged into a nightmare from which she can see no way out. How these characters connect to each other becomes apparent as we follow their actions in sections told from each one’s point of view, in the present as Nina takes Karin’s place; and in the past as we see how each person’s actions affect the other characters in the tense series of events that ensue. Although slow to unfold, the story is an exciting and involving one. Given the information provided to the reader at the start, it is not too hard to work out what is going on and why, but this does not detract from the plot – even though in the end it depends on information deliberately withheld from the reader. Unfortunately, in my view, the climax to the main story is marred by some unnecessary and protracted violence which, together with the coda explaining Nina’s character, are somewhat clunky compared with the more subtle approach of most of the rest of the book. The character of Sigita is exceptionally well portrayed, and is for me the most sympathetic character in the novel. Nina is more of a cliche; she’s a typical damaged protagonist (seems to be suffering from manic depression) who had a childhood trauma and has been compensating ever since, distancing herself from her husband and children in order to save them from herself, while compulsively helping other “outsiders”. I liked the Jan/Anne dynamics, though these characters are less developed, but thought that the Jucas/Barbara subplot less convincing. Nevertheless, though there are some flaws in the book, not least a tendency to overdo the back story in some cases, it is a very good read, highlighting some of the social injustices that are all too familar to us today from reading the newspapers and other crime novels. I received this book free of charge from the Amazon Vine programme. Read other reviews of the book at: Reviewing the Evidence (Yvonne Klein), Nordic bookblog, International Noir Fiction, DJ’s Krimiblog, The Crime Segments and at Barbara Fister’s place, in a post that also discusses the authors and others writing similar books. Most or all of these reviews provide more plot details than I have done, as does the cover of the book and the blurb on the publisher/bookselling sites. As usual, I think readers will enjoy the book more the less they know in advance about its contents! Author’s website (in Danish but if you use Google’s Chrome browser it will automatically translate it). Maxine – Thanks for this excellent review. This is one that’s on my TBR as well, and it’s good to know I have something good to look forward to reading. I have seen this book about a lot and I was waiting for a review of it. I;m not sure of the subject matter but it sounds like it was a good read. It is so difficult to decide somethimes just by reading the blurb. I will add it to my wish list I think. Thanks for the comments. By strange coincidence I have read several books one after the other about child abductions/killings and I think I would like to give that particular plot device a rest for a while. I think for a book to tackle that subject matter, it needs to do it in a sincere way for me to feel OK about reading it. This one was mainly OK in that regard, I think, but I feel it wallowed in the violence (one episode fairly near the beginning, and the climax) just a bit too much. But on balance, a good, solid piece of crime fiction. I hesitate to read about plots where children are harmed in any way. It just sets up a cloud over my head as I read and wonder if I can persevere. I’m now reading TBITS after reading so many positive reviews, but I reserve my right to skim or skip parts if I think it’s necessary. So far, it’s okay on that score. I just finished this and I liked it a lot, found it unputdownable. Very interesting. I liked the multiple points of view. It is difficult to read about children being harmed. However, this plot wasn’t as disturbing as I at first thought it would be. I agree that much of the violence at the end wasn’t necessary, and in fact, it detracts from what is a riveting read. It’s not the tone of the rest of the book. I’ll be lending it out and I’m sure friends will like reading it. I’m a bit perturbed that other books in the series haven’t been made available in English. I like the Nina Borg character; she’s as complicated as Liza Marklund’s protagonist. It’s challenging to read about complex characters, and how they get through life, solve crimes, while struggling with their own demons.